* This class has prerequisites. Please see details below. Learn all the steps in building a plywood lapstrake boat as you and your classmates construct a 9-foot, 6-inch Nutshell Pram in this nine-session class. 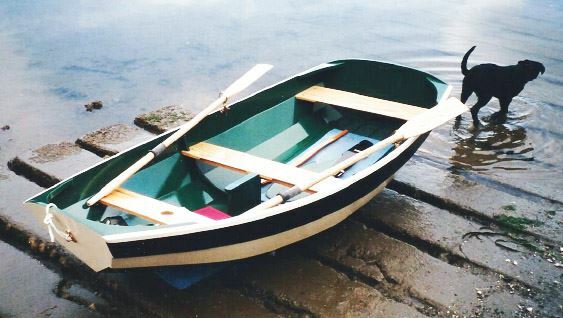 The well-tested plans result in a lightweight dinghy that's enjoyable to row across a sheltered cove or lake, or be used as a tender for a cruising boat. It can also be outfitted with a mast and sail — but those are for later classes. how to build and use jigs to cut scarf joints so you can glue up strong 10-foot-long plywood panels from 8-foot sheets. how to build a ladder frame and molds, the temporary supports that establish the shape of the boat. how to bend and laminate frame parts and assemble the building jig. how to shape parts with spokeshaves and hand planes to create accurate bevel cuts that result in tight joints between curving parts. how to apply epoxy to make the boat water-tight and durable. * This is an intermediate-level class, open to those who have some experience with joinery and hand tools. If you are unsure whether you have enough experience, please contact the instructor, Mike Gearheard, at 206-455-5404. You must complete Orientation to the Woodshop and Woodshop Tool Safety Checkout 1 and 2 before the class begins. If you have not already taken these, please register for them before you sign up for this class. The pre-requirements will also qualify you to use these tools during our 30 hours a week of open studio time. It may be necessary to work on the boat during open studio time between class sessions in order to complete it by the end of the class. Open studio sessions are always free for members. Non-members taking this class can also work on the boat during open studio time without an additional fee. The $13 materials fee covers shop supplies plus your own copy of "Building the Nutshell Pram" by Maynard Bray, a 32-page booklet that shows all the steps. BARN will buy the actual boat materials because it will eventually be sold in an auction.